Are you craving more color and variety in your meals? You're in luck. Polyphenols, you remember, are the chemicals that give fruits and vegetables their brilliant colors, and when eaten in large amounts are also anti-inflammatory. Nature's magnificent color palette of fruits and vegetables has something to please every pallet. The produce aisle in today’s grocery store is a showcase brimming with variety. It's like a Zone dream come true. You’ll find everything from the exotic looking red and purple carrots to green fiddleheads (unfurled fern shoots) to zucchini squash in endless hues, shapes, and sizes. Not too long ago my local grocery store offered only a few varieties of onions, basically red, white and yellow. Now I can choose from Texas sweet, Vidalia, baby pearl whites, salad onions, Spring onions, shallots, chives, Spanish, scallions, Ebenezer (yes, really! ), Bermuda, and the list goes on-- and that’s just the onion section. 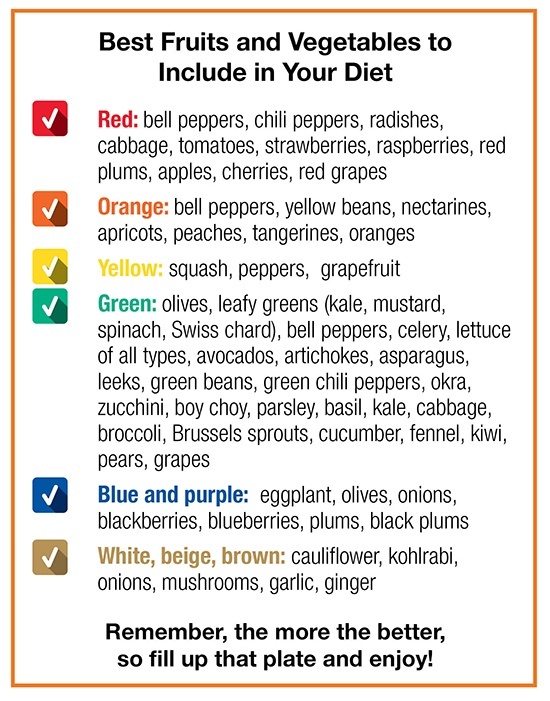 Choosing foods in all colors of the rainbow guarantees that you're packing a huge variety of nutrition onto your plate. Another perk I've noticed, when making meals with color in mind, is that I end up with larger portions of vegetables on my plate. The more vegetables you eat, the easier it will be to support healthy blood sugar levels, helping you experience the many benefits the Zone diet has to offer. Putting it all together is easier than you think. Keep it simple. If there's not enough time in your day for cutting vegetables, buy ready prepared fresh vegetables. Even though they might be priced a bit higher, I find they’re more economical because I can get greater variety with less waste. No one wants to end up with a refrigerator full of once gorgeous produce past its prime and ready to be tossed. Bottom line, the ease of meals and the time saved are well worth it. Pick up some ready cut vegetables for grilling. It can’t get much easier. I recently chose a package containing large chunks of red and green peppers, red onion, zucchini, and yellow squash, plus wooden skewers. The only prep needed was to arrange the vegetables on the skewers, drizzle with a little olive oil, and pop them on the grill for 10-15 minutes. The result was an irresistible plate full of color and flavor. There's just something about big chunks of red onion straight off the grill. It’s one of my favorites. Very tasty indeed! We enjoyed the veggie skewers with Zone orzo, chicken, and a small dish of blueberries and sliced peaches for dessert. Brightly colored raspberries, strawberries and blueberries are your best fruit choices for the Zone. Berries are the least stimulating to the blood sugar of all the fruits, and they're loaded with fiber and those very important polyphenols I mentioned earlier. Add a few to your next bowl of Zone cereal, grab a handful with a snack, or just savor a dish of ripe red raspberries with any meal. Whether fresh or frozen, when it comes to berries you can't go wrong. Remember, the more the better, so fill up that plate and enjoy!